In Washington Monthly’s annual college rankings measuring universities’ contributions to the public good, the University of California, San Diego has been rated the No. 1 college in the nation for the fifth consecutive year. The rankings are based on three categories: social mobility (recruiting and graduating low-income students), research (producing cutting-edge scholarship and Ph.D.,) and service (encouraging students to give back to their country). According to the Washington Monthly, these rankings are especially relevant now, as this fall, the Obama administration will release its plan to rate America’s colleges and universities. “The administration’s new ratings, which are scheduled to go into effect in time for the 2015-16 school year, will include measures of access, affordability and outcome, similar metrics to those used by Washington Monthly for years,” the editors noted. The magazine revised its methodology this year. Now it uses the three most recent years of data, instead of the most recent one year of data, to more accurately rate colleges. Each college ranked was given an overall score to represent the combined scores of the Washington Monthly’s three metrics—social mobility, research, and service—where the highest overall score is 100 and the lowest is zero. 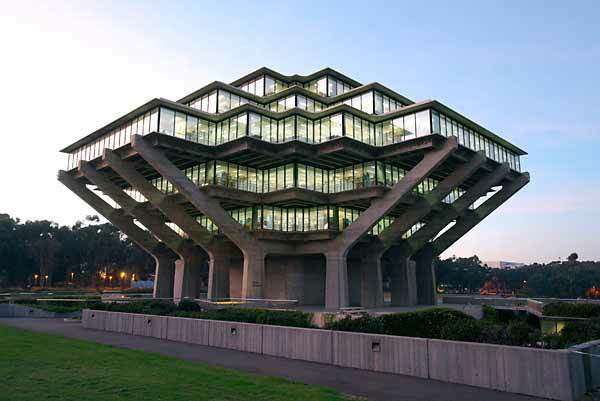 Only one university got a score of 100: UC San Diego. In addition to UC San Diego’s top honor, the University of California as a whole received praise by Washington Monthly, with six UC campuses included in the top 20 of the list and four campuses listed in the top five. UC San Diego was ranked high by the publication for social mobility, based on the number of students who receive federal Pell Grants (need-based grants to low-income students) and their graduation rates. At UC San Diego, approximately 60 percent of students receive need-based financial aid and nearly 44 percent of students receive the Pell Grant. Among the various UC San Diego initiatives that are designed to promote social mobility is the Chancellor’s Associates Scholars Program. The scholarship, which was announced in spring 2013, is designed to help make a UC San Diego college a reality for students from historically underserved communities. It first applied to students from Gompers Preparatory Academy, Lincoln High School and The Preuss School UCSD and has since been expanded to community college transfer students from San Diego City College, Southwestern College and Imperial Valley College. Other additions to the scholars program include students from federally recognized tribes and Reality Changers, a non-profit organization that provides inner-city youth from disadvantaged backgrounds with the resources to become first-generation college students. Chancellor’s Associates scholarship recipients must be eligible for the University of California’s Blue and Gold Opportunity Plan, which covers tuition and fees for California residents whose families earn less than $80,000 a year. The $10,000-per-year Chancellor’s Associates Scholarship covers additional costs including books, transportation and living expenses—essentially providing a full ride scholarship to attend UC San Diego. In addition to social mobility, the Washington Monthly ranking was highly based on civic engagement, measured by community service participation, students who serve in the ROTC, alumni who go on to serve in the Peace Corps and more. UC San Diego currently ranks 12th in the nation for Peace Corps service, with 54 alumni currently serving in the field. 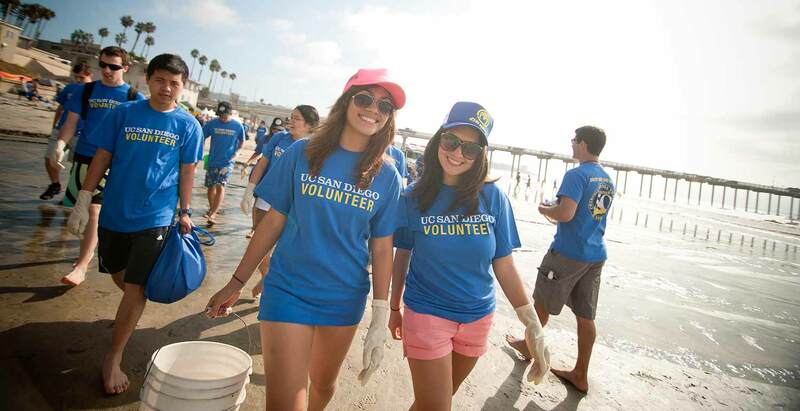 UC San Diego has 575 registered student organizations, and 92 of those organizations have a primary focus on community service. A total of 14,275 students are engaged in a form of community service and in 2013, the university’s students completed 2,138,760 hours of community service. In addition, the campus started the Volunteer50 initiative in 2010, which encourages all students, staff, faculty, alumni and campus friends to participate in community service throughout the year. To encourage more participation, Volunteer50 recently launched a pilot program to provide funding grants and collateral items to support service events organized by other campus groups. In the research category, Washington Monthly took into account the number of undergraduate alumni who go on to receive a Ph.D., faculty awards and research expenditures, among other criteria. During the most recent fiscal year, UC San Diego received more than $1 billion in research funding, positioning it among the nation’s top 10 universities for annual research funding. For more information on the Washington Monthly College Guide, go to washingtonmonthly.com.